Beauty and sensuality come to mind when I think of Taurus people. That doesn’t just include Sun sign Tauruses. When the Moon or the Ascendant is in Taurus, when Venus is Rising (close to the Ascendant) or high in the sky (close to the Midheaven), when there are a lot of planets clustered together in Taurus (known as a Stellium), even when a great number of planets are found in the 2nd House, then you’re going to get that special effect of earthy gorgeous sensuality for which the sign is known. I’ll start with Persephone, my granddaughter, who has just turned 8 years old. Last year she said, “I want to be a designer when I grow up. I’m already an artist.” She is quite the little Taurus all right. She is constantly drawing and painting beautiful pictures of finely dressed ladies whose clothing is exquisitely detailed with flowers, jewels, etc. She has an eye for line and color and will tell you if your outfit looks good. She is photogenic, too, and can pose like a pro. Like a Taurus, she is sturdy. Though petite, she can swim 8 laps in a 50-metre pool without a problem. Her tiny body is solid as a rock! Her Mom sent me one of her drawings awhile back and it was ‘Totally Taurus’ including $ signs surrounding the entire drawing of an elegantly dressed man with a bag of gold beside him. Here’s what she said about it, “The Piper was very vain and very greedy. He had lips as red as a red red rose. Eyes as sharp as a knife, and as blue as the sea. He loved himself. Oh, his clothes! Don’t let me bring up his clothes. His clothes are so red and he’s so tall with a cape made of lace.” Goodness. She whipped that one out without any prompting. The love of color and beauty seems ingrained in the sign and the people who embody it. One outstanding example is my friend, Mari. She, like Persephone, is petite, but her art packs a wallop of blazing color and big round sensual shapes. Everything Mari does has flair and pizzazz. She’s always dressed beautifully herself. She has other virtues of the sign such as warmth and loyalty in friendship, and a deep and abiding desire to create peace and harmony wherever she goes because she cares for the earth and her peoples. Ingrid is someone lovely both without and within. The home she shares with her husband in Belvedere is out of a Taurus’ dream. It truly should be featured in Architectural Digest. She transformed their old Victorian and brought it new life all in creamy whites and yellows with large sweeping verandas over-looking the bay. Comfort and beauty are in every nook and corner. Being in Ingrid’s presence is like basking in some exotic garden. Yet another artist is Eileen McDavid who truly does the Earth Woman thing, and wondrously so, with pottery and sculptures. She creates from a veritable fountain of inspirational themes that endlessly stream from the cosmos into her hands and emerge as archetypal goddesses and gods for garden and home. I shouldn’t forget the men with Taurus’ qualities. Manny may be a High School Vice-principal out in the world, but at home he’s ‘The Lord of the Manor’. I’ve seen him take a few acres of land and transform it into a mini Green Briar estate. Artistically he’s a great photographer who moon-lights as a wedding photographer. William may work with money matters by day in a large brokerage firm, but at night he’s a master chef and enjoys the comforts of home to a T. Yes, Taurus men love their comforts! They are generally quite comfortable to be around as well. 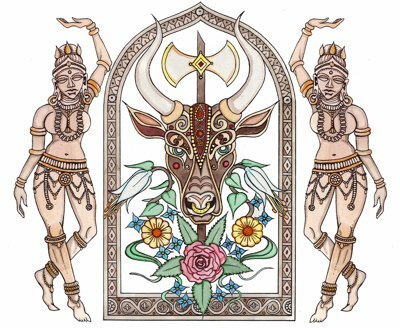 Many fine musicians draw on the vibrancy of Taurus. Folk singer, Jamie Byrd, is not only a good singer, she’s a fine lyricist as well. Her home in San Francisco is filled with a fascinating medley of delights, which she has collected—yes; Taurus loves to collect—from all her touring days. Even her web site is evocative of her solar nature with those vibrant colors. My husband’s niece, Mary, and her husband Tom Erangey play and perform in a band in the Chicago area. Mary, like so many Tauruses, combines her practical skills in the workforce with a sideline in the arts. Mary is creative in a multitude of ways and I’m sure she will integrate those talents more holistically into her life in the next few years. Dance is another great arena for Taurus people to excel in. Our daughter, Danielle, leads groups in Synergy Dance, a totally energizing and delightful way to exercise and be sensual all at once. Their web site gives you a sense of this work and features Danielle, as well as other dance instructors in the class section. Danielle started dancing with the San Francisco Ballet at the age of five. She, Mari, and Ingrid, also ballerinas when young, continue to possess the poise and grace that comes with that kind of training. Jesse Dishart dances and performs with flair and style that most sensual of all dances, Tango. We just saw him dance this weekend with our other dancing daughter, Rose. They are part of the Liber Tango Dancers in San Francisco. Like a lot of Taurus people, Jesse works by day as Director of Finance at Electronic Arts, Inc. and—yep—does his ‘other thing’ still on the side. Will these Taurus folk ever ever really follow their passion and their heart? Probably when there is enough money in their bank accounts. Of course, they would say to me that they are being ‘practical’ and taking care of business. I know, I know; they don’t want to be ‘poor starving artists’. This blog is starting to sound like a commercial for some of the beautiful Taurus people I know. Funny how easily I fall into marketing them all. 🙂 This must be part of the mystique of the sign. My files of Taurus clients contain actresses, models, interior designers, investment bankers, landscape designers and contractors, in addition to what I’ve already described, but there are also teachers, therapists, public relations and human resource managers, etc. What are some of their distinguishing characteristics besides their abiding involvement in beauty and sensuality? I’m going to illustrate by paying homage to a very old friend with whom I lived for a couple of years when I was young, struggling, and sometimes foolishly floundering like a fish out of water. (I am a Pisces, after all.) Natasha was a flight attendant who started that career fresh out of high school, and stayed with it. Steadiness is a strong Taurus trait. She loved the colorful life, but she was a pragmatist and kept her job even if she’d been playing hard on her days off with all the crazies of that hippie era. Reliability and dependability went with her back to work no matter what. She was a natural American beauty from Pennsylvania, but she loved to bring ethnicity back with her from wherever she traveled. Guatemala was one of her favorite places to go and I remember well seeing her after one trip with colorful shiny ribbons braided into her hair and a bright embroidered blouse on. With her tanned skin she looked like an Earth Goddess. She came back from Yugoslavia, land of her ancestors, dressed like a Serbian Princess in the most outrageously embellished long suede coat. She collected wonderful and strange objects from all over the world to embellish her home with. Exotic is an understatement. There was the python skin, the wicked stuffed piranha, along with the woven garments, rugs, and bags purchased from various tribal peoples she would encounter. Taurus loyalty was her second nature. She would stick it out through thick and thin with those much weaker than herself. She was their rock and sometimes she’d roar like a bull seeing red, but they knew it was for good reason. She had good sensibilities and had no time for shuck and jive talk. I felt safe with her because I always knew exactly where she stood on things. I also knew I could trust her hands down. She was and is solid, like the earth. I’ve spent very little time on the shadow aspects of these ‘beautiful people’. Perhaps I just like blowing their horns for them. In truth Taurus folk suffer just like the rest of us. I’ve heard the most horrendous stories of betrayal, near death experiences, abuse, degenerate diseases, and catastrophes that anyone could imagine from these salts of the earth souls. They can be awfully stuck and stubborn in their patterns and fixed beliefs. They can hold grudges long after they forget what it was all about in the first place. They may refuse to find out the other person’s side or point of view. Tis true. They are still, however, beautiful people in my eyes and, bottom-line, their virtues usually outweigh their faults. May all Tauruses flourish in the Garden of Eden they so much want to create here on planet Earth. Thanks for up-dating the list of well known Taureans, Kylie. Quite a mesmerizing group! And, yes, Taureans are very very ‘basic’. I appreciate your in-put.